Welcome to the best wireless dog fence reviews and guides on available online. I know just how unsettling it is when you can’t know if your dog is contained within its designated play area. All of our reviews of electric wireless fences for dogs have been written by people who have used the fencing in question. We do our best to cover both sides of the story: the good and the bad. 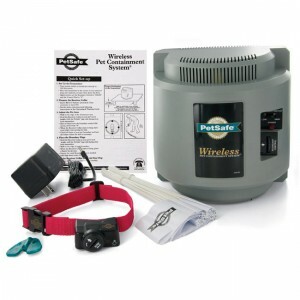 We only review wireless dog fences made by two manufacturers: PetSafe and Havahart. While there are other manufacturer’s out there, we have found that these two offer the best value for your money, and the finest installation and dog training manual with the package. Collar Neck Size 6" - 23" 6" - 23" 14" - 26"
Min. Dog Weight 8 lbs. 5 lbs. 8 lbs. Please refer to the comparison chart above, which lists the top 3 best electric wireless dog fences in our opinion. Underneath each model we’ve listed all the important specs, such as minimum supported dog weight, coverage area, transmitter and receiver measurements, number of correction levels, maximum supported number of dogs, and so on. Please note that while these are primarily wireless fences for dogs, they can be used for any pet that meets the minimum weight requirements, as long as the animal can be trained properly – this is probably the main difference between a wireless fence and the bark collars, which often cannot be used on anything other than a canine. We strongly believe the models above are the only ones worth your money. We could easily review 20 different models from a bunch of fence manufacturers, though we feel it would be a waste of both your and our time. Quality wireless technology is expensive and hard to come by. Other dog fences not mentioned here have not only serious signal instability issues; they also have unstable receivers, which often fail to deliver a correction when required and – even worse – they deliver the correction accidentally, without your dog even approaching the perimeter of its play zone. We honestly believe we’d be doing both you and your pets injustice by even referencing any models other than the best three reviewed above. Please read the next section for more information on this. This last one might need a bit of explaining. When we say boundary instabilities, we mean that the invisible fence boundaries will tend to shift back and forth every few seconds. Now, such shifting is common for all wireless fences for dogs and other pets, and it is a result of how current wireless technology works. But while this back-and-forth boundary shifting will be no bigger than 1 to 3 feet where Havahart and PetSafe fences are concerned, it can be as high as 10 feet in the vast majority of dog fences manufactured by other companies. Such shifts can be a particularly serious problem if there’s something dangerous on the other side of the boundaries, such as a street. When reading our reviews, please check what we have to say regarding the above-mentioned boundary instabilities, as it is probably the single most important and least-recognized spec. in any wireless fence for pets. You should also pay close attention to how often you need to recharge the batteries. Some wireless electric dog fence receivers can be recharged directly, while other models will require you to insert new batteries each time they run out of juice. Also, keep in mind that these fences operate based on wireless communication frequencies, which means you should keep large metal objects (mostly home appliances) as far away from the transmitter as possible – preferably no less than 3 feet away; failing to do so will result in signal interference, messing with the potential of the fence and increasing boundary instabilities. Again, our best wireless dog fence reviews include all the details regarding the above. Also make sure to read our pro’s and con’s. While it’s tempting to think that there’s a model out there that’s just “perfect,” this is not the case; all models have their pro’s and con’s, and your focus should be finding the perfect fence for YOUR needs. So please take your time to read as many of our reviews as possible and don’t make a hasty buying decision. The transmitter / control unit, typically with an LCD screen and button controls. This should be kept indoors, away from moisture and where temperatures never drop below freezing point. A wall anchor for the transmitter. The transmitter should be kept at least 5 feet above ground level. Batteries (either replaceable or rechargeable) for the receiver + battery charger if the receiver is rechargeable. Training flags (typically between 50 and 75). Depending on the type of transmitter mount, the package may also include screws and mounting hardware. Cost: a wireless fence will cost about 20% of what an underground fence will cost if you include installation and labor. Wireless dog fences are very portable, making them an excellent choice for those who rent their house and those who travel with their pets often. There are however a few things which make a wireless fence a bad choice. For instance, keep in mind that wireless models can only cover circular areas; and while you can make this circle as big as 200 feet in diameter in the best models, you won’t be able to provide coverage for unusually-shaped areas, though it is possible to use more than one transmitter to help alleviate this problem. Additionally, wireless dog fences suffer from somewhat more boundary instabilities; where the average underground cable fence will usually have less than a 0.5 foot instability, it’s usually closer to 2 feet in the best wireless models (PetSafe, Havahart), and can go as high as 10 feet in lower quality models. Depending on the model, some wireless receivers will only emit an audible signal when your dog approaches the boundary; other receivers will deliver a weak, harmless correction pulse; yet other models will both emit a beep and if your pet does not turn around, they will then deliver a correction. For some dogs the audible signal will be enough, though this will depend on the temperament of your pet, and unless you know his temperament very well, it’s always a good idea to get a wireless fence that comes with a receiver that features both an audible signal and a static correction. Your dog should not wear the receiver 24 hours a day; ideally, it should be kept on for no longer than 12 hours a day. Never attach a leash to the receiver collar, as pulling on the leash will cause the receiver probes to dig into your pet’s neck, causing pain and/or skin damage. The best wireless electric fences can support a minimum of two receivers, allowing you to contain two or more dogs with the use of just one transmitter. Your package however will only come with one receiver, so if you have more than one dog you’ll have to buy the additional receiver separately. Also, quality manufacturers will include two different sets of pins for the receiver: one pair for long-haired dogs, and another for short-haired dogs. Additionally, good collars/receivers will be water-proof as well. The static correction delivered by the collar probes can usually be programmed to one of a few settings (intensities), which is typically between 4 and 8 settings. When training your dog, always start with the lowest possible setting and slowly bump it up a notch until you find one to which your pet reacts, at which point there is no need to crank it up anymore. Finally, the best wireless fences for dogs / pets come with motion-sensing technology (Havahart is known for those). This technology can detect whether your dog is moving or not, and if it isn’t – it will shut down to conserve batteries. Once your pet starts moving again the collar will immediately detect that and reactivate. Mounting or taping (depending on the model) the transmitter to the wall and plugging it to a power outlet. Adjusting boundary limits using the turn-knob on the transmitter (this step is best done by two people). Putting the receiver collar on your dog. Don’t forget to put in the batteries. The most important part is choosing an optimal location for the transmitter. This should be on an outer wall within your house, and be as close to the very center of your desired circular roaming area as possible. It’s also a good idea to actually test the whole system before you commit to mounting or gluing the transmitter to the wall, to make sure it isn’t located in a place with a lot of signal interference. When doing your testing, make sure the transmitter is positioned as close to where you intend to mount it as possible and in an upright position. As far as installation goes that’s all you need to do. Make sure to read our best wireless dog fence reviews for detailed information regarding installation procedures for a particular model. However, keep in mind that you will also need to train your dog to respect the boundaries of the fence, otherwise the system will not work – installation alone won’t cut it. Make sure to read our detailed guide to training your dog for more detailed information. In short, the training process will involve you placing training flags along the invisible boundary of your wireless fence, spaced 10 feet apart. Then you will spend one or two days training your dog to avoid going beyond the flags (with the fence turned off), and to properly react to the warning beep emitted by the receiver: you’ll walk your dog on a leash up to the fence boundaries, and as soon as the beep is heard, you pull your pet back into the play area, praise it and give it a treat. You should do frequent (3-4 / day) but short (10-15 minutes) training sessions. Once the first 1 or 2 days are done and your dog has learned to react to the beep, you will want to train it to react to the correction pulse as well, following a similar procedure to the one outlined above though doing it for a longer period (1 to 2 weeks). To finish things off, you will want to make sure your dog won’t cross the fence boundary while excited, so you should train it not to run past the boundary when you throw a ball or a treat across it – this is called “distraction training” and we go through it in our guide. The entire dog training procedure is simple actually, and all quality wireless fences come with a very detailed manual (printed or DVD) on how to do it properly, and you can always refer to our guides or ask us questions directly as well. Now it’s time to act. Take some time to read our wireless dog fence reviews, find one that is right for your needs and budget, and go through our maintenance, dog training, and installation guides for a clear picture of what you’ll need to do to keep your pet well within the play area and away from the fence boundaries. I have 3 large great danes. I have invisible fence now but I am moving and need another fence. The invisible fence has been great but it is very expensive, batteries, repairs, etc. Just a service call is $150.00. I am looking for a wireless fence that will work on very large dogs.